Proper use of paint is one of the easiest and least expensive ways to give any room makeover, and nowhere is easier to experience than in a small kitchen. Small kitchens have limited remodeling options, and careful manipulation of color and its impact on lighting can visually expand a kitchen and make it seem much larger than it is. This can be especially important if you are preparing a home to sell. 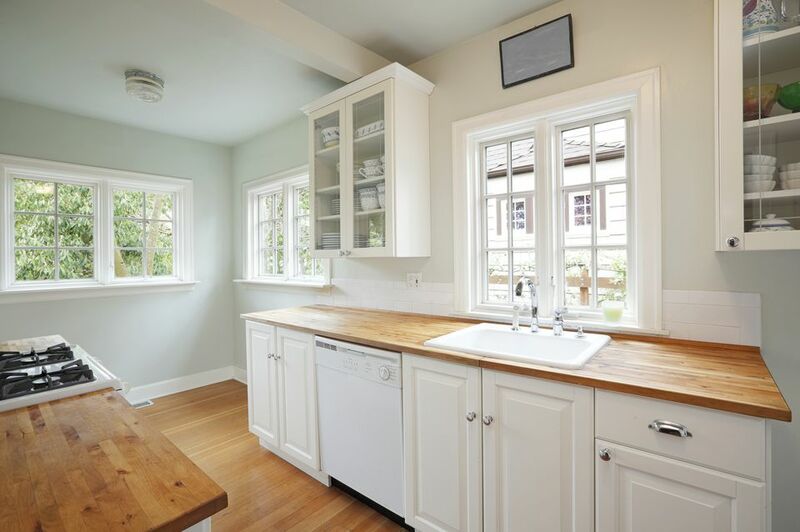 If you have a small kitchen, white and neutral paint colors can be a lifesaver. White paint reflects light, makes walls recede, and increases the sense of space. When you use it on your walls, countertops, cabinetry, and ceiling, you create a cohesive space with few boundaries or edges to limit the eye. To avoid making the room feel too white, use different shades of white or add different textures with fabrics or wallcovering. You can use a slightly different paint hue to highlight the crown molding and recessed-panel cabinets, adding interest to the room and preventing it from becoming too washed out. 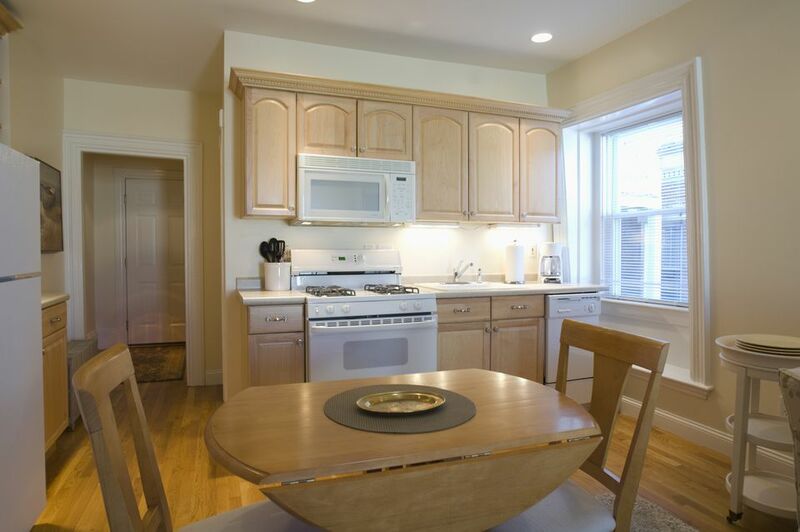 But it is also important to create some contrast and interest in your kitchen. Dark wood cabinets in a small kitchen absorb light and make the space feel claustrophobic, oppressive, and tiny. You can make the kitchen feel entirely different simply by painting those dark cabinets a lighter color. Stained and varnished cabinets require a bit of preparation, but you can easily make them look like new and completely change the look of your kitchen by painting them a light color. If the cabinets are in poor shape, considered renovating them by refacing them with lighter veneer and installing new, lighter doors and drawer fronts. Popular interior designers set trends, and you should pay attention to their painting ideas if you want your kitchen to wow buyers. Here are some tricks interior designers use in their own projects. Add some bright color: Mark McCauley, author of Interior Design for Idiots, suggests using dashes of color on unexpected accents like windowsills or the inner parts of shelves. When sharp hues mix with light wall hues, a kitchen looks more spacious simply because it is more interesting to the eye. Create an accent wall: Libby Langdon, who contributes to Small Space, Big Style on HGTV, says you shouldn’t be afraid of bold colors. She encourages homeowners to paint one wall in their kitchens a deeper color than the rest. A darker hue can make a wall recede into the background, enlarging a space. Use the same paint color for walls and trim: The owner of Charlotte Lucas Interior Design advises homeowners to use the same paint color on the walls and trim. As there are no gaps in the trim, the ceiling will appear higher. When home buyers step into the room, they will get the feeling that it is bigger than it really is. Minimize contrast with countertops and cabinets: When painting your walls, countertops, cabinetry, and shelves, use colors that are different than the walls, but without a huge contrast. Choosing colors in the same color family is a useful strategy. Without abrupt shifts from light to dark, your kitchen will look spacious and serene. Sharp contrasts, on the other hand, create visual boundaries that halt the eye and make a space feel smaller. Keep ceilings white: While the recent design trend is toward using colors on the ceiling in many rooms, this is not recommended for small kitchens. A bright white ceiling will seem higher, making the room feel more spacious. White ceilings also reflect light, maximizing the effects of any natural daylight present in the room. Avoid flat-gloss paints: Eggshell and satin enamels make for slightly reflective surfaces that allow light to bounce, which can make a room feel larger. Woodwork and trim can be painted with a medium-gloss enamel. Avoid flat-sheen paints, which tend to absorb light and can make a room feel smaller. Enamels have another important advantage for kitchens: They are more washable than flat paints. Natural lighting has the ability to expand any space, making it feel larger and brighter. While your kitchen may have only one window, you can optimize light by choosing light window treatments or using blinds that can dress up your kitchen window without blocking the light. An opaque shade can let light in while maintaining privacy. Where the remodeling budget allows for it, adding a window or tube skylight can be a lifesaver in a small kitchen. Where windows aren't a possibility, adding indirect undercabinet lighting can also help a room feel larger.